When you seek legal counsel for important personal or business challenges, you want a lawyer who’ll do more than give you advice and then walk away. At Kondori, Moorad & Niesen, L.L.P. in Fairfax, Virginia, we are not like other legal practices. 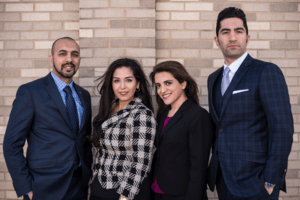 Our lawyers use the real-world experience we’ve gained to guide clients from beginning to end in matters relating to estate planning, immigration, business law and other concerns. We take the time to learn the needs and goals of everyone we represent to achieve a successful solution. Serving clients in Washington, D.C., Virginia, Maryland and Ohio, our attorneys place critical emphasis on ethics, morals and integrity, as we work tirelessly to make a positive difference. Hands-on approach — We take proactive measures to help clients protect their legal rights and take advantage of opportunities. Whether you’re a business looking to thrive or a family seeking to preserve its wealth, we strive to be active partners in your success. Personalized attention — No legal solution works for everybody. By devoting personal attention to each matter, our attorneys develop detailed strategies tailored to your goals. Affordable fees — Throughout our work, we never lose focus on your overall well-being. This includes answering your questions promptly and maintaining cost-effective rates. Don’t hesitate to take the first step to get the legal help you need. Our firm offers a free initial consultation and works tirelessly to bring you the peace of mind you deserve. Estate planning — For all estate planning needs, we prepare effective legal instruments such as wills, trusts and advance medical directives so your intentions are honored and your loved ones are protected. Business law — We provide comprehensive business law counsel to help small and large firms handle contracts, formation issues and other challenges. Immigration — The complicated U.S. immigration system makes it difficult for people seeking a visa, green card or naturalization. Our firm clearly explains the requirements and walks you through each step of the process to achieve your goal of living and working in the United States. Elder law — If you’re concerned about disability planning or another elder law matter for a senior loved one, we’ll make a thorough review of the circumstances and advise you of your options. Labor and employment law — Our labor and employment attorneys counsel employers and workers on the proper treatment of individuals who have been hired as employees or contractors. Regardless of your particular objectives, we have the skill, experience and foresight to deliver results that benefit you now and in the future. Kondori, Moorad & Niesen, L.L.P. handles various legal concerns, including immigration, business and estate planning matters. We serve clients in Virginia, Maryland, the District of Columbia and Ohio. Please call 703-592-8577 or contact us online to schedule a free initial consultation. Kondori, Moorad & Niesen, L.L.P. is located in Fairfax, VA and serves clients in and around D.C., Maryland, Ohio, as well as counties in Virginia such as Alexandria, Arlington, Prince William, Loudoun, Stafford, Spotsylvania and Fauquier.